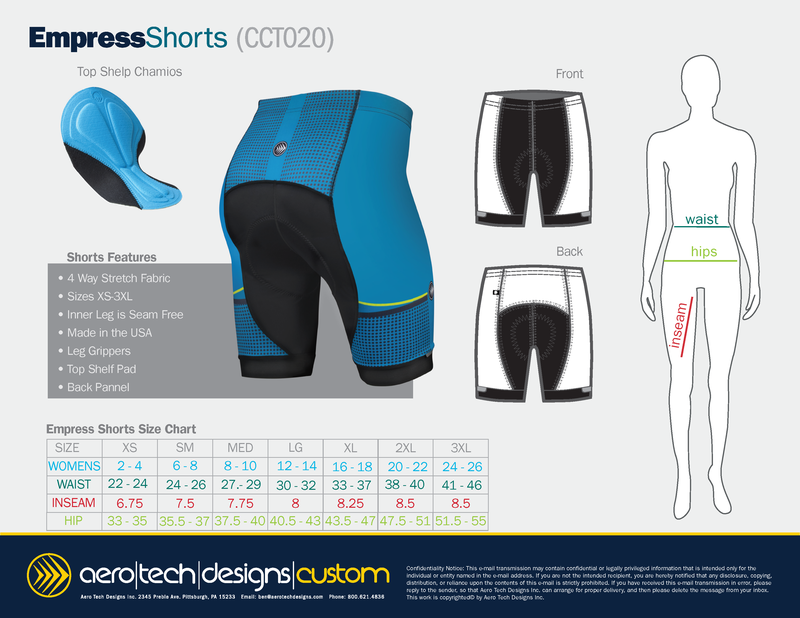 Aero Tech Designs presents the Custom Women's Empress Padded Bicycle Shorts designed for women specifically during the rigors of the bicycling motion! With our updated Top Shelf chamois pad inside, the Women's Custom Empress Shorts provide shock absorption, prevention of chafing, and cool breathability while delivering the comfort you want during long rides. This bicycle short is perfect for all levels of riders. Manufactured in the USA! The fabric of our Woman's Empress Bicycle Short gives compression support to help increase blood flow to your muscles. The leg banding has a comfortable, lightweight gripper that allows the shorts to stay in place and provides support during each pedal stroke. * Waist elastic is soft, non-roll with smooth cover stitched seam. * Smooth, seamless inner leg reduces opportunity for abrasion and sores. 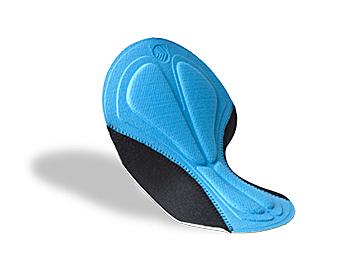 * Chamois Padding is 3D engineered for maximum comfort on the saddle. The Women's Custom Empress Short was designed to have the right balance between a training and racing piece of cycling clothing. Cut for a seamless integration to the rider, the Women's Empress Short have an open band-less waist with minimal elastic to keep the rider in maximum comfort. The waist band was designed with band-less waist allows the midsection of the rider to expand and contract during breathing without constricting or binding natural movement. At Aero Tech Designs we take chamois pads seriously and we know that women and men have different needs when it comes to the chamois. That's why the Women's Empress Short arrives with a female version of the internationally acclaimed Top Shelf Pad. The Top Shelf Pad uses the latest in chamois pad technology. The design of the Top Shelf Pad start with perforated multi-density foam inserts for miles of comfort wrapped soft anti-microbial fabric. The finished product is a short that will go the distance and will look vibrant for years to come. Feel your best and ride the best with Aero Tech Designs women's custom Empress short. What makes this pad special in our Women's Empress Shorts? It is the fantastic fit that comes from an engineered pattern that fits the curves between the legs and around the pelvic area. The side wings on this pad offer comforting fit around your legs and torso. The Multi-Layer Pad (MLP) is designed with smooth edges that wrap the body curves between the legs and around the torso. The Chamois padding's surface in the Custom Empress Short is a smooth, antibacterial, hygienic microfiber, that is laminated to foam and tricot for a three-part, high performance anti-chafe pad. It is extremely breathable, lightweight and stays dry to inhibit the growth of bacteria that can lead to saddle sores for long distance cyclists. Minimum 5 Endless possibilities of color, text, logos, and design elements on your shorts.